Indicate the care status, current progress, progress limitations, pre-existing contributions as well as a custom typewritten assessment. All verbiage is randomized and user-customizable. The plan is simple yet powerful. Choose the user-customizable care status and visit frequency. Select a modality and then select the regions to apply the modality. You'll see the summary in the lower left hand of the window. All modalities and regions are customizable. Even their sort order can be set so your popular modalities are at the top of the window to avoid unnecessary scrolling. All random text generation associated is totally customizable. Simply right-click on the modality list to get a Windows popup menu to take you immediately to the customize tools. Press the button to automatically generate your note at any time. Adding a diagnosis is easy. Select the ID below, or the ICD below, and you'll get a drop-down list so you can choose diagnoses. But there's more. ChiroPad EMR uses date & time "stamps" such that you have the entire diagnosis history available to you. You'll know the diagnosis description and when each diagnosis changed throughout the history of the patient. 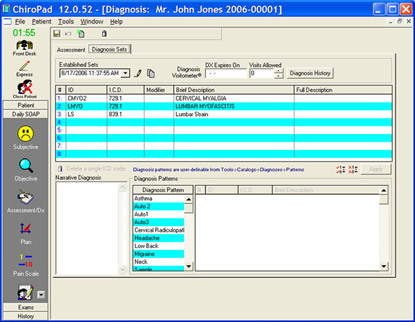 Press the "binocular" button to search for diagnosis "patterns" for inserting common diagnosis sets. At any point when you select the button, all windows will be filed automatically and you will see a nicely generated SOAP visit. 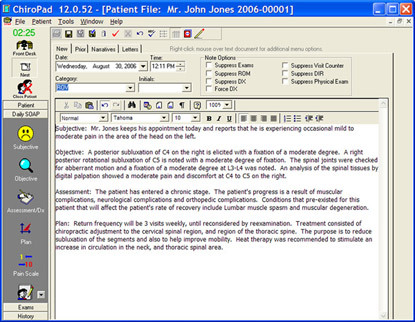 ChiroPad EMR's random text generation gives you a very high dictation quality note to describe your services. The random text generation ensures that your notes will not sound "canned" when you make the one or two changes applicable to today's visit, and leave the remaining findings unchanged. The user flow ChiroPad EMR is very natural. Paraphrase can be used for final editing and grooming to insert any additional text you desire. All notes are stored in your computer for easy retrieval upon demand. You can choose to print notes for the currently active patient (for example, an attorney request), or print notes for all patients within a date range (for example, submitting SOAP notes with insurance claims). Life Systems Software is dedicated to the healthcare profession by developing and providing EHR(electronic health records) and EMR(electronic medical records) and practice management/billing software since 1992.